Yesterday, I made my way to my local Target feeling excited to see Nate Berkus' new line and to show my support in the way in which it counts the most-- with my wallet. Unfortunately, upon getting there and searching various parts of the store, Nate's collection was noticeably absent. After the epic failure of the Missoni for Target debacle, I hoped that Target had learned their lesson in preparation of much anticipated product launches, like the new Nate Berkus collection. I've seen countless beautiful ads for this collaboration in all of the top shelter magazines, I have personally been pitched the collection for coverage on LDV, I was involved in promoting Nate's new book, and I know how much we were all looking forward to scoring some of these "chic and cheap" finds. Nate has been one of my favorite designers for years, so while I was at Target, I expressed my disappointment to one of the managers who could only tell me so much as "we get new shipments every night and we don't know what's coming." Really? You have one of the top designers in the country designing a collection for you that thousands and thousands of people will want to purchase and you couldn't even get organized enough to ensure that the product would be on the shelves for the widely-promoted launch date? I am blown away, Target. I have been a loyal Target shopper for years and years, but I am beyond annoyed about this, especially after the awful disappointment of the Missoni launch. Target, it would behoove you to make sure you have all of your ducks in a row in preparation for product launches like Nate's. I tweeted about my experience while at the store and got a reply from Target encouraging me to shop online. Unfortunately, most of the goods are sold out or are only available in store. Which stores exactly, Target? I've heard from friends around the country-- from Califronia to Arkansas saying that the collection was nowhere to be found in their stores either. Above all, I feel disappointed for Nate. Just imagine being in his shoes, expecting to have this fabulous launch, only to hear that your fans and customers are disappointed and that instead of raving about his products, we are ranting about Target's lack of organization and follow-through... yet again. What gives, Target? Have any of you had any luck finding Nate's new collection at your local Target stores? Seriously! You would think they'd learn but nope, I hope this gets fixed quick or it's going to be another huge disappointment. I live in a suburb of Columbus Ohio and I've been to two and neither had this line. there's one more I will try because there is one item I'm after. but you shouldn't have to go to 3 stores!! Frustrating! 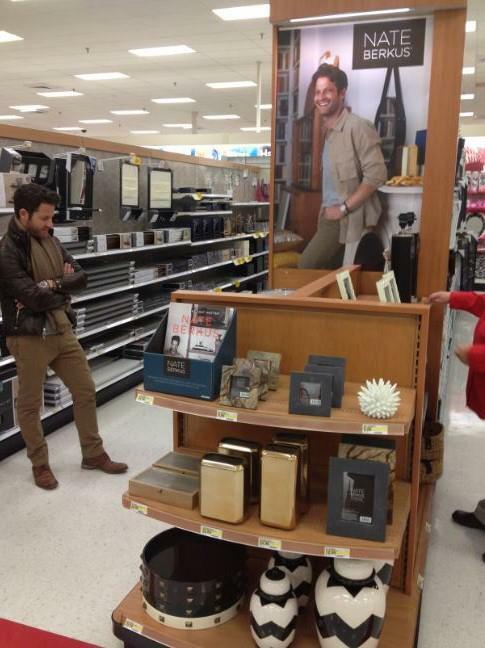 I eagerly visited Target yesterday too and all I found of the Nate Berkus collection was a few bedding items. Disappointment. It didn't even look like items were picked over, they were just non-existent. I was afraid of this! It's really unbelievable that they allow this to happen. Especially after it's been promoted to death and blogged about everywhere. They have folks showing up on the very day with checkbooks in hand. Ridiculous. I had the same experience! The only merchandise they had in our stores were the bath items. I checked product availability online before I went to the store and when I got there nothing was there! Not even a sold out end cap! I too was so excited for the launch (I may have marked it on the calendar). But out of necessity, I had to stop by Target the day BEFORE the launch. To my surprise, particularly after the Missoni debacle, they already had the display set up. It looked like it had been out for at least a day and was completely picked over. The remnants were knicked/dented as if they had literally been rifled through. So sad. I had the same experience at my Target. I spoke with two associates and they expressed their frustration that Target promotes these launch dates but does not ship the whole line to the local stores on time. When this happens, the stores end up displaying items piecemeal, customers get frustrated, and the store has to offer substitute items. They then showed me the display shelves they emptied in preparation for Nate's line. I stopped by again today, and it was the same story. Meanwhile, Target's website shows that some items are in stock at my local store. Target needs to get its act together. No luck in AZ either. I went to my local store Sunday afternoon. They had a few pillows but everything else was nowhere to be seen. One section even had a display poster half-hung and about to fall of the rack with a bunch of empty shelves and some brown boxes of stock just laying on the ground with no employees in sight. Sigh. Luckily I live in a small town in South Florida where it seems the population is completely immune to Target's collab advertising. (I was one of maybe 3 people who went to the Missoni launch at 8am and thus had the pick of the store.) Yesterday, I went to my Target to check out the Nate collection and walked away with both items I wanted - the chevron jar and gold bowl! From what I have heard around Blogland today about Nate's launch, my experience is definitely few and far between. So disappointing that more people were not able support Nate and get the things they wanted from his collection! I thought my Target (Corpus Christi) was the only one behind! Nothing on the shelves. No advertising either. I asked one of the workers if the merchandise was going to be set out later in the day, and she has no idea what I was talking about. I guess I got lucky? I knew it would likely launch at midnight Minneapolis time (since that's where they're headquartered.) I logged on at 11 PM West Coast time and it started dripping in, item by item. I added what I wanted to my cart, checked out (with no problems or blips like the great Missoni debacle) and got an email today it's all been shipped. I haven't tried to visit the store, but I thought the online handling of it was much better than Missoni, when the site crashed or items disappeared from people's carts. A good 70% of the collection is still available online, and while the most popular pieces are not, it's not sold out entirely. So I'm frustrated too but not for the same reasons. I totally understand your disappointment! I went to my local (Austin, Texas) Target yesterday too with a list of things I wanted to buy from the Nate Berkus collection and was told that they are running behind a week or two...REALLY?!?! I was so angry!!! I love Target, but they need to get their act together! I'm in a suburb of Dallas and they had one small endcap with a few things. I was very disappointed. I ordered a couple of things online that morning because I wasn't sure if I would make it to Target on Sunday. Crazy though. You tell 'em! I feel your much anticipated let down. I appreciate your honesty and candor. Thank you for speaking truthfully. I'm so annoyed with designer blogs praising Target and IKEA. I went to my store-Rogers, AR yesterday morning and found nothing, when I asked the associate she said she hadn't even heard of it. The associate went to ask someone in the back who said it would be out tomorrow (Monday). I went back today during lunch and still nothing. I asked again and this time the associate did know what I was talking about and they were "hoping" to have it out by tomorrow. I was so annoyed I left my cart in the middle of the aisle(that will show them). My excitement is waning at this point, I know I can go online but I wanted to see it in person and it shouldn't take 3 trips to do so. YES!!! I was so upset. I live in Socal and I didn't get the chance to head over yesterday and I was afraid that this morning I would be out of luck...I get in and it's no where. they had a couple bed linens and bath, but had no decor. I asked an employee and she said they may have it out by next week! What the?! I actually did see the collection in a Long Island Target this Saturday. The Las Colinas Target near my office actually had the Nate bedding items out last week (5 days before they were supposed to)! I forgot to head back yesterday and see if the whole collection was in stock, but it sounds unlikely. I know retail training and store operations are a huge hurdle b/c of employee turnover, but for something as big as this Target should be ashamed and publicly apologize to Nate B.
I saw his collections (Sacramento, California) for the bedding. Didn't look into the home decor though so no idea id it was or wasn't there. I live in a suburb of Salt Lake City and was able to find Nate's line on display waiting for me. I picked up two of the large chevron urns as well as a tray, and a couple of other small accents. I went to Target today especially for the items in Nate's line and would have been incredibly disappointed if it were not available. So frustrating for you! I hope it makes it way into your local target soon! I am in Seattle and went to my local store at 9:00am Sunday morning - the lamp, and several other pieces I wanted, were already sold out (the employee I spoke with said they didn't get a huge inventory, and stuff might be coming in new shipments.) I did get the hammered bowl and black and white jar though! NO!!! I went there today and found NOTHING!!! They said they'd have it up by Thursday. This is an epic fail, I agree. I have been there 2x so far to be disappointed. My Target in Gaithersburg, MD had the whole line (as far as I know). I have to say, though, I found it pretty underwhelming. The "brass" urchin looks like plastic, for instance. The newest Target by my work had items from the collection on display before the launch and the shelves were stocked. I was fortunate enough to wait in line during the Missoni launch and scored with house goods. The Target's in Tucson weren't prepared for Nate's launch yesterday either. When I asked an employee where the collection was, I was told that a memo was sent down that morning saying it was going to be delayed. I was able to stop on my lunch today to get an item but overall it was very disappointing! I went yesterday in Redwood City, CA and nothing. I was super disappointed. Thought I'd try my luck in Cupertino, CA today and they had everything out, and not at all picked over. I went to my local Target looking for the tortoise shell by Nate Berkus. I found the display with four of the tortoise shells - each of them was broken around the edges - VERY disappointed! Packaging was obviously inadequate to keep them from getting damaged - glad I didn't order this item on line - I'm sure it would have arrived broken. I actually found Nate items in my local store (suburb north of DFW) on Friday. I just wasn't very impressed with the minimal selection. The same thing happened at my Target store. I went in about 2:30 in the afternoon and they were JUST putting the bedding on an end cap. It was really disappointing. I didn't end up getting anything I was so excited to pick something up but alas there was nothing I couldn't live without. Totally agree! I went to 3 Targets yesterday and nothing! Completely disappointed! Target, get it together! Well, how disappointing! I haven't even been to Target yet, and I'm glad I haven't because I'm certain my stores won't be stocked with Nate's line either! I remember the same thing happened a couple of years ago with the Liberty of London launch. There was almost nothing in either of our stores during the entire promotion. Target needs to get its act together! I just happened upon his end caps today while shopping for something else at Target (San Diego area) and bought two items. The gold hammered bowl and the rams? Head sculpture. I only bought them to support Nate, and they were attractive in style, but the quality wasn't that great. The bowl is actually silver with gold paint thinly applied. They do have a lot of his items on line if your Target can't get their act together. I assumed everything would be gone but was quite surprised when I went to Meyerland store and asked an employee and they said it had not been set up yet...something about a truck being late. They told me to come back later and I did but it was only bedding! They also mentioned when there is a launch they do not put it out until that Mon-Tue. which I know is incorrect bc I've picked up items from other launches on a Sun. I happened to have a few extra mins. to my afternoon and went to the Main store and picked up the tortoise shell and small hammered gold bowl but it was the smallest little endcap ever with a few items from the line. I never thought el paso would get things before the rest of the country but my local store had studded trays, lamps, shagreen boxes, hammered brass bowls, urchins in white and brass, large and small chevron urns. It was only one end-cap but it was there. I had the very same experience! I was so dissapointed that my weekend was so busy that I couldnt get to my local Target on Sunday, when the collection was supposedely going to be out, but instead I got to my Target at noon on Monday. I looked all around, but nothing! Finally I asked, and the 2 employees I talked to knew nothing about it. Finally they radio'd someone who said that someone would be working on bringing out the merchandise that afternoon!!! Forget it! I was beyond annoyed! I can't tell you how many times I've heard that "We never know what we're getting" speech. My store did stock the collection, but days early of the official launch, which seemed very strange to me. It was almost as if Target shipped out the product, but with no real explanation to each store as to when it was to be displayed. I was disappointed too! It took me 3 trips to Target to finally get 2 of the gold branch lamps. And they had them there in the back all along! I'm probably going to return them though. One was a little scratched. And they did not seem as bright gold as online. North Florida is the same way - my local store didn't even know what I was talking about. A few friends canvassed several area stores and the most we found was one end cap. They *said* it will all be out tomorrow (Wednesday). Super disappointed. I tweeted about it too but no response. We dont even have a Target......yet? Now I don't think I want one! I went on Sunday and there was nothing! Not sold out, just not there at all! I even put a reminder on by Blackberry to go check it out. Shame on you, Target! My employee Christy who lives in SC found his collection, only it was very limited. And the only reason why she knew it was his collection was because of his book sitting next to it...no advertising that it was Nate Berkus collection. I can't say if its at my Target right now bc I'm in Mexico. I was faced with similar disappointment from one store in Las Vegas. Where the manager told me and a friend that there was no set release date and they could put the items on the shelf at anytime during the week. So I immediately went online to shop only to find that several of the items were already sold out. A little sad and more then a little ticked at target we tried one more store and found that nothing had been unpacked their either. After expressing our frustration to the store manager who had no idea who Nate was or the following that these items would generate. However, unlike the other store who gave major attitude she knew how to keep her customers happy and immediately sent three employees to the back to bring out every box they had for the select group of us who had gathered. There were about five or six of us in total and we watched patiently as the staff unpacked every box and we had first pick of everything we wanted. In the end I think we all got most if not all of what we were looking for leaving us with four piled high carts and the store with less then a shelf full of merchandise. Im just glad that someone was willing to go through all of this to satisfy their customers. After the Missoni debacle I really had hoped for more but it looks like we are never going to get it from this retailer. Best of luck to you and I hope that you eventually find what you are looking for. I had the same problem at my store. I figured there would be a large display with his face featuring the new line. After walking up and down every aisle, I noticed that his bath items were tucked in with other brands. Same with his bedding and I didn't notice any of the decor items. Someone had to say it and you did it masterfully! I went to Target hoping to take a look especially at the brass lamp that is shown in every advertisement only to finally stumble upon a few towel and bath products stuck on a back aisle. I agree that a store with as much clout as Target could hire people who know how to promote and release a new product. Not only Nate but some of the other "stores" they brag about that only end up showcasing a few of the items advertised. I sure feel sorry for not only Nate but the next designer Target chooses to spotlight. I just want to say that this is not a new problem. It is chronic and impacted me both times that John Derian launched a collaboration with Target. I was met with complete BLANK STARES from the managers at the Northern VIrginia Targets that I went to in search of the merchandise despite all of the promos for the collection. Such ridiculous customer relations! The other problem is that there is a wide swing in terms of quality as other commenters have pointed out. Some of the products are fabulous and well worth running around for (though we shouldn't have to) but other times you search something out only to say "What the %$#@?" because the quality is so poor. Frankly, I am very surprised that these high profile designers don't demand better product delivery and quality. BTW, also love your fashion posts! I'll have to check out my local Target although I'm sure I'll find nothing! I hope they learn their lesson before the release of the Target and Neiman Marcus collection this Christmas! Same here! I went the day of the launch and there was nothing. When I asked the staffers, they said, "Nate who?" The next day, there was one end-of-aisle display with a few home decor items. No bedding, no bath. And everything was already sold out online. Very disappointing. I had the exact same experience at both of the Targets in Napa, CA. And honestly, I'm totally over Target at this point. The Missoni launch was a joke and so has every other launch before and after that. I am a Buyer for a major home furnishings company, so I'd like to think I know a thing or two about retail. The corporate team at Target is a joke if they think this is acceptable after all of the marketing efforts they've put behind this. Seriously! The Sourcing, Planning, and Merchandising teams behind these launches should be fired. And I don't mean to come off completely rude and insensitive but this really is a joke. I'll still shop at Target for all their low margin product like toothpaste, advil, etc. But you can bet your next paycheck that I will never get duped again by one of these completely ridiculous designer launches. I've had that happen to me too and I was told by employees to drive out of my way to another store. Have a lovely rest of the week! Yep...same experience here. Went Monday, the day after the supposed launch and found nothing but the bath items. Asked a Target employee who called the manager and was told to look in the same area I'd been in. Did a second scour of the entire home decor/bath/bedding/drapes, etc., area and found nothing. No sale here. Do Tell: What are your Online Must-Haves?